Yet another busy weekend greets us at the box office, with five new wide releases for a second straight weekend. With so many new movies in the marketplace, logic tells only a handful can capture the attention span of the public, which should make this a very interesting weekend. 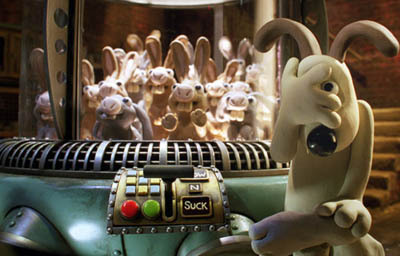 Heading up the slate is Wallace and Gromit: The Curse of the Were-Rabbit, showing at a summer-like 3,645 venues. The animated film is the latest from Aardman Studios, which is renowned for the Wallace and Gromit shorts (which won two Oscars) and Chicken Run, which was the studio's first feature length film. What had been a cult following has turned into a plain old following, especially since the success of Chicken Run. For a couple of reasons, it made sense to release a new original concept before the Wallace and Gromit movie, namely because the dynamic duo are a little tougher sell on their own. Wallace is an eccentric inventor whose distinguishing characteristic is a fanatical love of cheese, and Gromit is his mute companion and confidant, a dog. Their wacky adventures tend to result from some unintended function of one of Wallace's inventions, or from an interloper seeking to take advantage of his gentle nature. The stuff of Shakespeare and Sophocles it's not, but it's Nick Park's skills with characters and visual humor that makes the series what it is. This film doesn't boast the giant celebrity cast that has marked recent animated films, with Ralph Fiennes and Helena Bonham Carter lending their voices to supporting characters. Although Carter was the second featured voice in another recent animated film, it's tough to imagine this being a big factor in this film's success. Rather, it's the entirely family-friendly subject matter (the plot concerns, of all things, a missing vegetable patch and a mysterious creature that lends its name to the title) and the built-in audience that should make this film a winner. With the wide exposure, near rapturous reviews (running over 90% at Rotten Tomatoes), this is a good bet to be another hit for Aardman studios. Look for it to bring in $17 million this weekend. New films this weekend do a very good job of appealing to many different demographics, which gives them a fighting chance. In Her Shoes is this weekend's film to appeal to the female segment of the audience. Starring Cameron Diaz and Toni Collette and directed by Curtis Hanson, this film is based on a popular novel about the clash between two sisters whose lifestyles have never meshed. Collette plays the upstanding yet frumpy older sister, while Diaz is the wild go-getter who has never really had to take care of herself. When circumstances put them back together after a period of estrangement, old issues come to the surface, especially about their mother, who died when they were much younger. The film also stars Shirley MacLaine as the two women's grandmother, who serves as a go-between for the two. Diaz has come a long way since her debut in The Mask, though this film is obviously no Charlie's Angels. Collette remains mostly a supporting actress, with her odd forays into leading roles not proving that lucrative (see: Connie and Carla, or better yet, don't). With the film skewing as female-centric as it does, the audience is certainly limited, albeit loyal. The top-flight director and writer team (responsible for L.A. Confidential and Erin Brockovich respectively, among others) should also help, and I would expect this film to earn around $9 million this weekend. Two for the Money is one of the first movies to cover the high-stakes business of sports betting, and stars Al Pacino, Matthew McConaughey and Rene Russo in a thriller about a mentor (Pacino) and a gifted protege(McConaughey) in one of the top New York "advisory" firms. When the picks are going well, all is right and well in their worlds, even if there's a bit too much manipulation of character going on. But when the protege, a former college football star, starts to lose his touch, a dangerous game starts to develop off the football field. Has he really lost his touch, or has the manipulation finally gone too far, causing an elaborate plan to be laid? Take a guess. This is a heavily testosterone-driven film, with both main actors working their egos and chewing scenery to great effect. Pacino hasn't had a major movie in theaters since early 2003 with The Recruit, which opened to $16 million and was one of the first films to break Colin Farrell. McConaughey has had an up and down career, recently having a moderate hit with Sahara, which opened to $18 million. This film faces a couple of problems in that there's no real action, and that neither lead character is really that nice of a guy to root for. However, as a demonstration of (over)acting chops, this film is right up near the top. I don't see a great weekend in the cards for this film, which should earn about $6 million over the three-day period. Waiting is the directorial and writing debut of Rob McKittrick, which looks behind the scenes at your typical neighborhood franchise bar & grill restaurant, and the quirky characters therein. Starring Ryan Reynolds, Justin Long, Anna Faris and Luis Guzman among others, this is a comedy in the Office Space-meets-Super Troopers mold (the restaurant is even called Shenanigans! ), with vignettes covering inter-restaurant romances, annoying customers, impossible bosses and the day-to-day little death of working in the service industry. Debuting on 1,652 screens, this film has its ticket pre-punched for cult-DVD status, despite the relatively attractive young cast. Look for it to earn a meager $4 million this weekend, although it's not impossible that this could be a film that is talked about for years to come. The Gospel is the last of the new wide releases this weekend, albeit on under 1,000 screens. For films targeting a black audience such as this, this isn't always an impediment to success, although it faces an uphill battle. This film concerns a group of young African-American gospel singers, who face personality clashes when tragedy and philosophical differences about the church drive them apart. A major attraction with this film is obviously its soundtrack, which features some of the brightest stars in gospel music. However, the appeal and star power for this film is somewhat limited, with Love & Basketball's Boris Kodjoe playing the lead role in the film. It should earn around $4 million this weekend. After two weeks on top of the box office, Flightplan will relinquish the top spot. Earning $50 million so far, the film has reaffirmed Jodie Foster's box office draw, as well as the market for an honest (so-to-speak) thriller in the "child-in-danger" subgenre. Legs for the film have been respectable, and should lead to another $9 million this weekend. A big test comes this weekend for Serenity, the film adaptation of the TV series Firefly. After coming out of the gate with a respectable-but-disappointing-to-fans $10 million, legs for the following weekends could have a big effect on whether sequels are made. Given its modest $40 million budget, that's not a huge task, but every little bit helps. The extreme fanboy nature of the film works against it here; however, reviews from even non-series watchers have been enthusiastic. It shouldn't fall as fast as other films of its type, but it is probably looking at just $6 million for this weekend. Other returning films of significance include The Corpse Bride, which dropped fairly steeply after a pretty good start. It should be line for around $5 million this weekend, and will push its overall total over the $40 million mark. A History of Violence should also come in around that figure, having received a lot of positive word-of-mouth for being an unflinching thriller. The Greatest Game Ever Played curiously comes close to doubling its screens after earning only $3 million this weekend. While that figure won't change this weekend, it hardly seems worth the expense of over 800 new prints.